The Rogue Psyker is a bit of a classic character in Warhammer 40,000. In short, they're cult leaders or shamans who directly communed with the powers of the Warp. As such, they're for the traitor side only - as emphasised by the detachment already having the Tainted Flesh or Cult Horde provenance. Note that in Tempest, the points value of this HQ selection was omitted. The Forge World FAQ updates this explicitly to note they're costed at 35 points (base). They're actually remarkably weak in the stat department - at least at the base level. This is offset by the cheap points cost, multiple wounds, and access to level 1 psychic powers. The feel no pain rule will help them to stay alive, but not for too long. I'd certainly recommend upgrading to the Alpha Psyker just to improve the stat line. They don't have too many upgrades available. Interestingly, they already come with the likelihood of possession. This means that when they die they have a 2 in 6 chance of being replaced by a Possessed model. If they die due to perils of the warp, this increases to 5 in 6. This is amazing - don't be afraid of rolling lots of die for him or her, in the hope of generating a possessed replacement from perils of the warp. No other upgrades to be bothered about to be honest. Take a tainted weapon or don't - I don't think it'll help this HQ too much. Take malefic demonology perhaps. Or place near a big blob of troops that might benefit from some biomancy or pyromancy. Telekinesis is probably a secondary option in comparison (maybe). Before there were Commisars, there were Discipline Masters. They function in exactly the same way you might think they should. They're assigned to squads for whom the Imperium is a new master (or even an old one) and are there to uphold the ideals of the Imperial Truth and the distant Imperial rule. And of course, they do that by shooting anyone too cowardly to stand up for the Imperium. But not other HQs or medical staff, naturally. Their targets are going to be regular squad members. Their obvious strength is associated with their leadership boost and the ability to re-roll failed leadership tests. The latter, of course, is where the shooting of the cowards start. Not so obviously, they are also a way to sneak in an extra weapon in to a squad: whether this is a hand flamer or a power weapon, or something else. Like most of the militia, these guys are just mortal humans, and likely to suffer in a space marine dominated environment. They need to be inside big blobs of troops, inside transports, or otherwise in a quality supporting position. Their relatively cheap points cost helps with this and the ability to take 5 in a single HQ choice is excellent, and indeed: a must for 30k gaming. Some example builds to toy around with. Discipline Master, needle pistol (25 points). I must admit that I like the needle pistol. The low S is more than made up for by the rending and the poisoned nature of the weapon. It can hurt enemy space marines - which is what we want here. Discipline Master, Carapace Armour, Refractor Field, Hand Flamer, Power Axe (47 points). A more full build designed for close combat and sneaking in a hand flamers and power weapon to the deal to make sure they can scare space marines. Discipline Master, melta bombs, bolt pistol (27 points). Might as well take a bolt pistol for improved S in ranged attacks. This melta bomb equipped master is for going with a squad who is wanting to explode tanks basically - and is therefore kept deliberately cheap. Today, we're going to start to look at the Imperialis Militia and Cults Army List. To understand this list, we need to simultaneously look at the Force Commander entry (i.e. the main HQ selection) alongside the major benefit it can give to the force he or she commander. In particular the force commander has the "Muster of Worlds" special rule which permits up to two Provenances of War to be selected. Given the above, the chief strength of the Force Commander is to grant access to an army-wide boon, for an appropriate points value. On top of this, they are highly customisable, as one might expect of a Force Commander from any number of worlds in the Imperium. In effect, their strengths are also their weaknesses. By selecting certain Provenances, others become unavailable. Some have strong restrictions that will affect the army build. Ultimately, the character of the Force Commander, and the Provenances they take will almost determine the focus of the army entirely and how it should be deployed. Perhaps this is not surprising, but my point remains: any strength is offset by some restriction or other that needs thought. Here are a few "standard" builds to toy about with, before we progress to the Provenances themselves. Force Commander, Power Fist, Melta Bombs, Digital Lasers, Power Armour, Iron Halo, Planetary Overlord (120 points). For a force commander, this is expensive in terms of points. But it is one that is dedicated to survival and close combat in particular. The Planetary Overlord rule has been bought so that the army can gain access to a specifically selected warlord trait. Ruthless Tyrant is useful for the bonus Ld. But I actually think a Merchant Princeling might be superior! But the there's the Connoisseur of Alien Curios which could be vital in a 30k game for causing fear. Force Commander, Power Armour, Iron Halo (75 points). This one is probably the baseline one that I would consider, built primarily for survival and hiding out in a big squad, or inside a transport. The player can select up to two of these. But which ones are any good? Warrior Elites: By increasing the Ld score of each squad, this makes the warriors much less likely to flee in terror from power armoured superhuman space marine brutes. This can be vital in this arena. For squads like grenadiers, it also means that discipline masters are no longer strictly required. Use for close combat, or in-the-open shooting armies. Gene Crafted: I really like this one. The bonus to S and I is absolutely amazing. But the penalty of not benefitting from medical staff is a significant draw back. I'd take this one for a close combat orientated army. Cyber-Augmetics: An increase in an invulnerable save will keep units alive longer than they otherwise would. Equally, I'd prefer feel no pain from a medic to be fair. A suitable upgrade for Iron Hands influenced worlds perhaps? Alchem-jackers: The ability to not suffer negative modifiers to Ld is simply amazing in this environment -- recall that the stubborn rule is at a premium for all 30k armies. Outside of combat, a unit becomes pinned instead of falling back, which is also really good. This makes the rule good for close combat armies with fire support. In addition, the ability to take Frenzon is a solid boon too. Armies with this will be close combat ones. The World Eaters will respect these mortals and might even work alongside them. Survivors of the Dark Age: With a bonus to their armour saves, this is an army that will be filled with superior warriors. Indeed, the "drawback" of having to take grenadiers is not a drawback much here: they get an impressive 3+ save. They're therefore just like space marines in that regard. The advanced weaponry upgrade is a good one too. The bonus S cannot be overlooked - but only for things like laslocks and lasrifles to get better than bolters range, but comparable S. The grenadiers might as well have bolters in most other cases. Feral Warriors: Clearly much conversion work can be undertaken for all of these options, but I'm particularly taken with this one. With bonus WS, and the option of taking the Blade and Fury upgrade for bonus attacks, this is clearly a close combat army. Abhuman Helots: The genetic mutants gain a toughness bonus, which across the board is simply amazing! Who cares if they get a negative initiative? The discipline collars can take care of some of the issues associated with striking later in combat perhaps. Cult Horde: Turn your commander in to a possessed daemon; and gain zealot across the board. You'll be allying with the Word Bearers and Emperor's Children no doubt. Tainted Flesh: Another traitor provenance, the combination of fear, feel no pain and rending in melee is strong and means a close combat orientated task force, combined with lots of conversion possibility thanks to being mutated by the warp. Being able to take Mutant Spawn is nice, but there are strong restrictions in other provenances, as well as unit selections. I personally like the way that two of them can be combined: feral warriors with survivors of the dark age or even alchemy jackers is a nice one. Gene-crafted is a nice one to combine with some of these as well. Feral warriors and/or abhumans will work nicely with the traitor ones too. Long live the beast men for the abhumans, frankly. "I was there, the day Horus slew the Emperor." 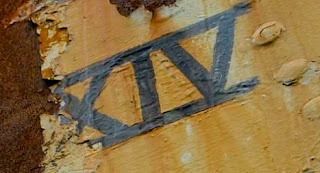 And it happened a decade ago, as evidenced in the image. If this makes no sense, then I'll elaborate. This sentence is the first one from "Horus Rising", the first publication in the Horus Heresy series of publications from the Black Library. This year marks its 10th anniversary. The entirety of the Horus Heresy from Isstvan III through to the Siege of Terra takes roughly the same amount of time in the cannon. Hence the reason for showing this photo is a demonstration that it has now been ten years since we started and we're nowhere near the Siege of Terra. I for one sincerely hope that it is not another decade before Black Library advances the plot sufficiently so that we can see the traitor fleet arrive at Terra for the final confrontation. Please don't drag it out - the "filler" novels can always be written later. Despite some injuries, I've recommenced the assembly of my Warhound #0004232. As recommended by the instructions, I began on one of the feet. But, being me, I wanted something a bit more than "just" a regularly posed titan. Hence I hit upon this idea that the foot should be doing something. Anything. Up in the air, ready to crush an enemy in front of it in a big stomp perhaps. Legging it along at an ungodly speed. Or something else. After scouring the internet and various images that google and others threw at me, I decided in the end to avoid the stomping pose. Not only did I not want the target of the stomp to be a given legion, or even eldar or orks, but in the end I just wanted something that communicated the terrain primarily rather than the fight. Hence, I opted to have the titan in mid-stride, crushing down on a building. But then, I also didn't want a particular 40k building like an administratum. I therefore looked to Warhammer Fantasy / Age of Sigmar for a bit of something different. And there, lurking in my accumulated bits, was this graveyard piece from the Garden of Morr. That decided it. It was suitably heathen looking that it would blend in with a pre-heresy campaign of compliance on a backward world, as well as being appropriate for heresy-era games. The pose, then, is of the titan advancing, and crushing the heathen building in its stride. Brutal and almost uncaring in its own fashion, yet simultaneously communicating the sheer mass of the titan crushing down all in front of it. I sliced in to the heathen building to make sure that the feet are coming down hard on the building - crushing it in stride. The building is also at an angle to the ground, implying that it has been uprooted from the ground with the stride of the titan. I'm a little undecided on the other foot yet. I might go for something flat, or slightly raised. The foot on the Morr Garden is effectively the leading foot (or front foot), and given its elevation, that means that the back foot must be almost on the ground, or at best have its heel slightly elevated. Suggestions welcome on how the rear foot should be positioned! Switching over to roleplaying games for today's post, and a bit of self-promotion. 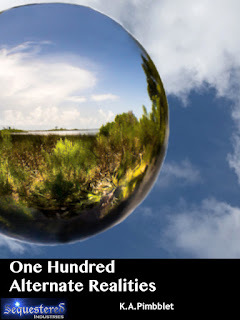 My company (Sequestered Industries) released this publication a couple of days ago: One Hundred Alternate Realities. Firstly it is a roleplaying game supplement that is written for any roleplaying game where alternate realities are going to be in play. As such, its not a gaming system in and of itself. But what it can do is provide many ideas for player characters and games masters who want to explore a multiverse of possibility. Perhaps the player group regularly steps through portals to alternate times and places. What would happen? Vampires stalk the dark night looking to drink blood! But that's been done a lot. Let's switch it up! Instead of blood, let's substitute magical items. Suddenly the player character party that's carrying a plethora of magical items looks like very attractive prey to these alternate reality vampires. In One Hundred Alternate Realitie, we give a wide range of alternate realities and a selection of nouns that can be substituted between each reality. Organized as a d100 chart the book is not just a one-liner per entry affair. On the contrary, each of the possible alternate realities is explored in a more detailed manner with possibilities outlined for the consequences to society and a few plot hooks thrown in. technology has radically changed reality (e.g. what happens if tractor beams are everyday objects?). These descriptions all contain material that can be swapped between each other to create even more exotic and random alternate realities. This book is presented in a system-agnostic manner and is can be used with almost any roleplaying game if a GM needs to build a novel alternate reality of Earth or elsewhere in the multiverse. I'm very happy to also report that following publication a few days ago, this publication has debuted at numb 31 in the top 100 of roleplaying products in RPGNow (as of the time of writing). Hope that you find this useful and enjoyable. Comments and enquiries most welcome. In my overview of the basics and synergy concepts for building army lists in 30k and Horus Heresy era gaming, I noted that it is worth trying to take rites of war for armies as they can really enhance what the list is capable of. Today, I'm going to break that nominal rule, just to demonstrate that its the exception that makes the rule great! Today's army list features the Night Lords and Sevatar. Hence, it could potentially have a rite of war due to Sevatar's Master of the Legion rule, but I'm going to argue it doesn't need it. Its one of the classic cases of an army doing better without it. Why should this be so? Well, in short: the Night Lords are one army that can potentially do very well (perhaps better?) without a rite at all. That is because their special rules (causing fear, and the ability to teleport terminators in - at a points cost premium) is akin to a rite of war in and of itself and can be exploited better without taking a rite of war, as I hope to demonstrate below. Sevatar's warlord trait is master of ambush by default. This is actually really awesome and something that this army can (at will) exploit. Select carefully which units to use it on and then place Sevatar with one of the bulkier squads below. Master of Signal, artificer armour, trophies of judgement, power fist (110 points). To go with the heavy support squad. Primus Medicae, terminator armour, trophies of judgement, teleport transponder (130 points). To go with the terminator squad. Or any other squad for that matter really. Terminator Squad, 5 members, 5 chainfists, teleport transponders (225 points). Terror Squad, 5 members, Headsman with power fist, melta bombs, artificer armour (155 points). A nuisance squad - plain and simple. Tactical Squad, 18 members, all with bolt pistols and chainswords, legion vexilla, sergeant with artificer armour and power fist (265 points). The humble, almost maxed out tactical squad. It's not maxed out as I needed to come in at 1850 points. I was 20 points over, so we have 18 rather than 20 member here. It is that simple. Tactical Squad, 19 members, all with bolt pistols and chainswords, legion vexilla, sergeant with artificer armour and power fist (275 points). There are 19 members here so that Sevatar can tag along with them. Night Raptor Squad, 10 members, 2 with flamers, Huntsmaster with artificer armour, melta bombs, Nostraman Chainglaive (295 points). Strictly better than an assault squad, this squad provides a rapid reaction force to hunt down enemy infantry squads - particularly those holed up in cover. The meltabomb is defensive in case of being caught by dreadnoughts. Add in chain axes to taste is expanding. Heavy Support Squad, 5 members all with missile launchers and flakk, sergeant with artificer armour (220 points). An anti-aircraft and anti-tank role here. To be teamed up with the Master of Signal and hidden in some ruins until they need to go forth to take care of out-flankers. Firstly. Take a deep breath and count up how many models you have in this army. Sixty Five. Let's just repeat that and let it settle in. Sixty Five models in at least 3+ armour, with 12 in 2+ armour. Some with invulnerable saves too. For any army, 65 models is a tough ask to take care of. Sixty five models in power armour or better is awesome. This army gives the player a lot of flexibility. There are so many components that can start the game in positions almost anywhere they like. The terminator squad and the Primus Medicae and deep strike. Naturally, they should go together. The Night Raptor squad can also deep strike if needed. The terror squad can infiltrate. And on top of that 3 other squads get to set up as per Master of Ambush thanks to Sevatar. I'd consider putting Sevatar with the 19 strong tactical squad and set them up accordingly. About the only squad in a fixed position is the heavy support squad. They're going to team up with the Master of Signals and camp out in some ruins in the deployment zone. With this degree of flexibility, most enemies should be jealous. Even the Alpha Legion. And with this flexibility the strategy of the army can vary. But in most cases it will be aiming for an Alpha Strike (pun almost intended). Use the heavy support and the master of signal to lay down some significant firepower at the start of the game. Preferably take out a tank or a flier. Have the Raptors fly in to dislodge analogue support squads from their hiding places. The terror squad can be outflanked to creep up and cause fear where needed. Sevatar and his squad position with Master of Ambush. They're probably going to be joined by the terminators and the Primus Medicae when they're available from reserve. But they don't need to be. The terminators can use their chain fists to tackle enemy tanks close up, and instead the Primus can join Sevatar alone. Or any other squad for that matter really. Use fear, weight of numbers and everything else to throw at the enemy. That still leaves the 18 strong tactical squad that I've not mentioned. You probably won't even need them. Camp them out on an objective and have them laugh maniacally at the pitiful enemy? Or use Master of Ambush with them too? Your choice really. Seriously, who needs rites of war with a list like this? Add the Night Haunter himself in here for bonus laughs. But if that is not permitted, then I would expand the squad sizes of all of these squads before even thinking about getting tanks. Then in terms of tanks, I would consider items like the Spartan, Storm Eagle and the Caetus Assault Ram. Focus on deadly things that also transport troops and are hard nuts to crack. Avoid rhinos - you don't need them. Drop pods are possible, but again, why bother. Take instead more infiltrating or outflanking troops (or even bikes) to keep with the theme of lots of marines on the ground able to be wherever they're needed. Keep focussing on fast moving items, the ability to be where you want, and take weapons you need. To contract, start with the terror squad -- they're a distraction unit here. Then its up to you. Perhaps remove the raptors to make it under 1500 points or the two HQs that aren't Sevatar? It'll still be a powerful list regardless, but the synergy with these HQs makes it much sweeter. So I'd even toy with the idea of cutting down the squad numbers slightly. In assembling the Storm Eagle, I found that I needed to paint some of the interior before I continued. Hence I applied a black base coat and roughly painted some silver on most parts. I'm yet to finish this process, but its getting there. I don't think I need to be particularly complete or careful as the interior of the fuselage is not going to be seeing the light of day too much in all regards. Getting the engines on the sides of the flier was a bit tricky. I strongly advise that others who are following this series dry fit several times to get it right (measure twice and cut once and all that jazz). The really hard bit was attaching the side of the fuselage to the floor though. Even though I had spend some serious time getting the sections straight with liberal use of hot water, it became clear that I couldn't get it perfect in the finite time I have for the hobby. Hence, I firmly pressed the two segments together and drilled through at a 45 degree angle to each piece to apply a subtle paperclip size pin to keep them together along their length (about four or five in total). Together with trusty superglue, this is more than enough to keep the segments behaving themselves and in place. I will probably go back later and greenstuff over the holes prior to painting the exterior. The next few steps will be attaching the second side of the fuselage and then working on the cockpit. Again with the cockpit, I anticipate that I will paint the interior before placing the space marine pilot in to place. But this time, its more important to get the painting right as most assuredly the computers (etc.) in the cockpit will be seen by the exterior world. Terror Assault is the Night Lords unique rite of war. It accentuates what the Night Lords can do but other legions cannot: cause fear, use night fighting as their friend, and fundamentally: take lots of terror squads. Indeed, with this rite of war, we are forced to take 3 entire terror squads. The other thing that the Night Lords can do that others will find hard to accomplish is have their terminators deep strike in to play in any game - and not require a rite of war to do so. The only question in my mind here is whether to take Sevatar, or whether to opt to take a generic Praetor instead for this rite of war. Sevatar is excellent at what he does, and does grant Master of Ambush but his big drawback is the 3+ armour save and the lack of eternal warrior. Plus, terror squads have infiltrate regardless. It is for these reasons that for the Terror Assault rite of war that I'm going to select a generic praetor instead. Army List. (1850 points limit). Praetor, terminator armour, teleport transponder, trophies of judgement, paragon blade, digital lasers, volkite charger (192 points). This HQ gives us access to Master of the Legion and is kitted out for close combat. He is to be placed with the other terminators, below. Master of Signal, artificer armour, Charnabal sabre, melta bombs, trophies of judgement, volkite charger, refractor field (135 points). At first, selecting a legion Master of Signal over a chaplain might seem like an odd choice. But here, I'm using him for access to a Charnabal Sabre. So why a master of signal rather than taking a champion (and therefore a master crafted sabre?) - the answer is that he provides some much needed bombardment action for the army. After using this, he is a close combat monster with improved initiative to try to ensure that the lower striking members of any squad he is with can take advantage of their superior numbers inside combat. Place with any of the squads below you feel will most benefit from his BS bonus he can give to them. A fearless close combat squad designed to take out vehicles. Take a risk by deep striking them close to a valuable target. Team up with the praetor if needed. A bit of a suicide squad really. Could easily be replaced with a tactical squad instead. I include it here simply as an entertaining option (but pricey in terms of points). The choice is stark: 3 terminators to suicide strike a vehicle, or a large tactical blob. I can't quite make my mind up, so I'll leave the terminators here for now(!). Terminator Squad, 10 members, 5 chainfists, teleport transponders (475 points). Another teleporting squad. Can be teamed up with the praetor as well. Mortis Dreadnought, two twin-linked lascannons, havoc launcher (170 points). An anti-air option for pesky fliers. Terror Squad, 5 members, Headsman with artificer armour, melta bombs, Nostraman Chainglaive (150 points). A generic and small sized terror squad for causing fear in enemy troops and softening them up. To be infiltrated. Terror Squad, 10 members, 9 with volkite chargers, 1 with a flamer, Headsman with artificer armour, melta bombs, power fist (285 points). A kitted out terror squad, fit for infiltration. Terror Squad, 9 members, Headsman with artificer armour, melta bombs, power fist (215 points). A squad to team up with the Master of Signals if required, or to go it alone. Arguably the big negative about Terror Assault is the lack of focus on support elements that can help with an anti-tank role. This is fundamentally why we have both the mortis dreadnought (which is arguably a HUGE target), as well as melta bombs absolutely everywhere. The army relies on deep striking the terminators and drop pod, and infiltrating or outflanking the terror squads under the cover of darkness in the early turns to get in to position and take care of enemy tanks whilst ganging up on enemy infantry squads and trying to fear them off the table. The sheer troops count here is an issue though. I would therefore contemplate getting rid of the command squad and having a tactical squad instead. More tactical marines for bodies on the ground is really required to make things shine here. Add in some transport options and I think we have the basis for an excellent army. Particularly if we can wrangle a land raider dedicated transport. Other ideas include having more dreadnoughts present as well. A Sicaran would be a sound choice too as would a destroyer squad. These are just ideas, clearly there are plenty of ways to expand up to 2000 points and beyond. I would also entertain heavy chain blades on some of the terror squad for fun. Gah, and I don't even have any lovely night raptors in here yet either. Heck, there's such a lot of choice for expansion. To cut down to 1500 points, ditch the expensive command squad, and consider the necessity of the dreadnought if you know the opponent, otherwise its probably the master of signals that is going to face the chop. The weakness this list will have is against fast moving enemies that are based on bikes (etc.). It could really benefit from some more ranged firepower, or fast elements of its own (night raptors, or storm eagle transports). Fundamentally, its a bit of an alpha-striking army list. Just pray that your opponent is not a fear immune legion (Salamanders, Death Guard) who are riding bikes everywhere (unlikely, but I'd love to see a Salamanders bike list!). I will write at least one more Night Lords list, and in that one will try to focus a bit more on swift moving elements. On Isstvan V, the Iron Hands Primarch, Ferrus Manus met his demise at the hands of his once closest brother, Fulgrim. In this diorama at Warhammer World, the battle between the traitor Emperor's Children and loyalist Iron Hands is depicted in full. There are many gems in this scene, including the two Primarchs facing off against each other at the apex of a small hill, surrounded by their loyal terminators perishing in droves at their feet against each other. To say that this diorama is magnificent would be an understatement. It is certainly one of the best in Warhammer World and if you get to visit Nottingham, it is one that you will linger around for a long time! Do not stab yourself in the thumb with a 1mm drill bit. Following hot on the heels of yesterday's Reaping Death Guard Army List, today I wanted to focus on something a little bit different. This is one for the traitor Death Guard players amongst you: a Calas Typhon army list that takes the Orbital Assault rite of war. This is to showcase a different aspect of the Death Guard Legion -- their ability to take a lot of chemicals and plunge toxic death in to the face of their opponents. This plays to one of their key strengths -- the ability to take upgraded flamers, and their willingness to use disreputable weapons. As Master of the Legion and the First Captain, Calas Typhon is a force to be reckoned with and will be placed with his command squad of Deathshroud terminators. Command Squad: 7 Deathshroud terminators, with melta bombs (325 points). Typhon's command squad. Seven strong, because, ummm, Nurgle! Primus Medicae, terminator armour, combi-flamer with chem munitions (127 points). To also be deployed with Typhon's squad. Contemptor Deadnought with 2 close combat fists with heavy flamers and chem munitions (195 points). I might be tempted to swap out one fist for something like a Kheres here. What can the Death Guard do that no other legion can do? Bring really nasty chem munition flamers, of course. This army list highlights some of this with the terminators dropping in by deep strike and flaming away everywhere. Overall, this is a surprisingly balanced army list at first glance. Fundamentally, it is a deep striking army list powered by drop pods and by terminators. Both components combine to deep strike in to play where appropriate. Combining Typhon with the Primus Medicae and the command squad makes a really nasty pseudo-Death Star combination. Double wound terminators with feel no pain are simply nasty to dislodge if played right. On top of this, do not forget that Typhon is a psyker. And one with access to telepathy at that. You are not above using invisibility here folks, if you get that power. It is a really powerful combination and one to be feared. Fundamentally, use it as a character killer combination. Although it lacks power fists, it can usually cope. That said, if you do need to take down an enemy HQ deep inside a power fisted terminator squad, link Typhon and the Medicae up with the Grave Wardens instead. The grave wardens are to teleport on top of enemy vehicles and use their chain fists to solve that problem. They can function very well against troops as well. Similar statements can be made for the contemptor dreadnought -- it is a terrific threat to play. When designing this list, one thing that was gapingly obvious was the lack of anti-aircraft fire. This is partially solved by the primaries fighters. In a pair with the lascannons, they can certainly bring some hurt, but I might add in some mortis dreadnoughts if I had the spare points. Plus, despite the extensive deep striking nature of the army list, it is fundamentally a very close combat and in-your-face style list and lacks a lot of ranged firepower. More ranged weapons and fast weapons are needed here. Hence beware: this army functions as an alpha-striking army. You must do significant damage when you come in from reserves and take care of the enemy. The troops meanwhile capture any objectives and use fury of the legion when appropriate. It could do with a bit more synergy to be perfectly honest, but it can be competitive overall so long as you realise what this list is. I really wanted to include a legion destroyer squad in here with rad missile launchers for ranged rad attacks. Hence, this is where I would think about starting to expand this list. I would also think about including more aircraft to provide superior aerial support and threats. A heavy support squad all armed with heavy flamers with a drop pod would also be very fitting. And more grave wardens or generic terminators would be awesome. To drop it back to 1500 points, ditch the dreadnought and one of the aircraft possibly. [Image Credit: Galle by Thor, distributed under CC BY 2.0]. Of all the legions, none probably had a more sinister and worse struggle to free themselves from the confines of their home world than the Death Guard and Mortarion. In today's post, I wanted to look at building a Death Guard Army List for gaming in 30k and 40k games. If you have not done so already, I would encourage you to look at my previous posts on how to think about constructing army lists for the Horus Heresy era -- both the basics and the synergy concept. A brief look at the Betrayal of Calth list is similarly recommended. What is it that the Death Guard can do that other legions do not, or fail to fully replicate? What are the strengths of this legion? My earlier post on the legion rules covers most of this. Perhaps one of the most overlooked is that they automatically pass fear tests. They are one of the few legions that have an in-built hard counter to the Night Lords game plan, and will require being swept off the board to ensure a victory. Nor will they suffer pinning. They're used to hellish battlefields, but this is balanced up by a negative to their sweeping advance rolls. Their unique Rite of War is the Reaping. This allows them to bring an unprecedented amount of fire power to the table in the form of heavy support squads and veteran tactical squads as none-compulsory troops. Not only that, they can get move through cover, and purchase rad grenades for characters.But the cost is steep: no running, no flat out moves, no deep striking, and only one fast attack choice thank you very much. Yet, unlike many other legions, they are permitted to take fortifications. This is therefore a rite of war that calls for lots of bodies on the ground and somehow must compensate for being slow. How do we take advantage of this rite of war and all of the goodness that the rad grenades and bonus firepower can bring? I would personally favour a lot of troops, backed up by some key elements. Although I will write at least one more Death Guard army list to take advantage of their chemical munitions, I want here to focus on the Reaping rite of war. To use The Reaping, we need a HQ with the Master of the Legion to be our warlord. For the Death Guard, only Typhon can give us that as a named special character -- I would have personally preferred Crysos Morturg to write a bit more of a fully entry myself and for his infiltrate rule. Rask would also be cool for his tank hunters. Given that a Master of the Legion can re-roll their traits, perhaps aim for getting Master of Ambush to take advantage of this. Indeed, some infiltration could really help this army list. That's ultimately why I'm taking a generic praetor here. I'm also aiming for 1850 points as that's pretty typical for a tournament list. I'll detail below how to expand it to 2000 points. Legion Praetor, jump pack, iron halo, paragon blade, rad grenades, combi-plasma gun and melta bombs (195 points). Rite of War = The Reaping. This HQ will go with an assault squad (below). Take Rask instead as an alternative. Master of Signal, artificer armour, melta bombs (100 points). This is one to go with one of the heavy support squads. Assault Squad with 10 member, Sergeant with thunder hammer, artificer armour, melta bombs (285 points). A somewhat basic assault squad and a compulsory choice. Tactical Squad with 20 members, legion vexilla, Sergeant with power fist, artificer armour (285 points). A large body of troops on the ground as a compulsory choice. These are objective grabbers and takers. Heavy Support Squad with 10 members, missile launchers all around, augury scanner (290 points). A TROOPS selection that is none compulsory. Heavy Support Squad with 6 members, plasma cannons all around, augury scanner (245 points). Another TROOPS selection that is none compulsory. A third TROOPS selection that is none compulsory! Storm Eagle Gunship (210 points). The only fast attack permitted - and its a transport. TOTAL ARMY COST = 1850 points. This army list takes advantage of The Reaping rite of war by bringing more heavy weaponry than your opponent can handle. A full 10 krak or frag missiles every turn is nothing to be sneezed at and can handle hordes, as well as montrous creatures and tanks. The lascannons are there to handle tanks. The plasma cannons take care of more elite enemies like terminators, forcing enough saves to get through even invulnerable saves. All of these squads need to be set up well inside ruins or fortifications when deployment happens. Importantly, all of them have augury scanners to prevent infiltrators (such as the Alpha Legion) creeping up on them -- this is important as it would be a hard counter to this style of army. In addition, the interceptor rule that it allows them discourages nearby deep striking. Hence a deployment zone with overlapping 18 inch augury scanners is in place from the start. Add the Master of Signals to one of these squads to improve their BS, and to provide an orbital bombardment and its looking very good already. The full troops squad is to be deployed inside the storm eagle and transported to wherever it needs to be. In this way, we have some rapid moving components that don't need to sit on objectives like the heavy support squads are doing. The praetor goes with the assault squad and is there to hunt down both tanks, their contents, and other enemy squads. Subtle this army list is not. Effective, it can certainly be. It works by simply laying down a degree of firepower that the enemy simply cannot handle and making them stay in their cover. Meanwhile, the more rapidly moving components goes to hunt isolated parts of the enemy down. If in trouble, castling up will work. One problem they will face is against a flyer-heavy army list, but they should have enough fire power to cause such a list trouble and pause for thought. The enemy has to come to the heavy support components to win (assuming they're sat on objectives). The trick is to ensure you kill them before they reach you. Should the warlord trait be lucky and we get a Master of Ambush, we can infiltrate three of the squads plus the praetor. This may be a good idea for the core troops squads and maybe one of the heavy support squads if we can get them in to a superior position. For 2000 points, I would consider adding in a second master of signals (or siege breaker), or even Rask for his tank hunters ability and upgrading a few bits and pieces here and there, or throwing in another lascannon to the third heavy support squad. Flakk missiles would be a terrific addition here as well. I might even be tempted to purchase a fortification to place one of the squads inside if need be. To reduce to 1500 points, we would need to shed 350 points, so we would need to ditch one of the heavy support squads at least, and then probably think about reducing the tactical squad downward as well. One question that I've had a couple of times over the past week or two (for example, see the comment here) is whether I could design an army list for folks who have just purchased the Betrayal at Calth boxed set. You wish is my command! The boxed set comes with a typical set of ingredients for a space marine squad -- at least it would if it were ten millennia in the future. Each ten man squad gets some special weapons (melta, plasma, missile launcher, heavy bolter, flamer, combi-weapons) as well as some upgrades for the squads (power fists, lightning claw, power sword). There is also the terminator unit, the contemptor, the terminator captain, and the chaplain to consider as well. To be honest, there's not much to play with here in a number of ways. We do not have enough special weapons to form a support squad out of, hence for the basic marines, it is going to have to be tactical squads, or veteran tactical squads (assuming we're not counting them as something special from a specific legion). The other major negative is the lack of speed and deep striking ability to close the gap to the enemy. Hence this would be the first thing to invest in once you're looking at expanding the initial army. Certainly things like rhinos and other support tanks would be a sound idea. There is not much choice for the rite of war either. We either want an army without one at all (a distinct possibility), Pride of the Legion (so we can get terminators and veteran tactical squads for troops), or Chosen Duty (for a Delegatus HQ choice). With a bit of expansion (additional purchases! ), Orbital Assault becomes a good option here to focus on and one that I can certainly recommend. But it will require something like drop pods to be purchased. In the list below, I try to not incorporate too much conversion work as I want it to be suitable for a beginner. For the Rite of War, I'm going to select Pride of the Legion as the points cost is over 1000 points in total and therefore there's no real need to field a Delegatus. Legion Praetor, Terminator Armour, combi-melta, Master-crafted chain fist (172 points). This praetor provides the rite of war and should be fielded with the terminator squad below. The master-crafted status on the chain-fist is just for fun really and can be removed if desired. Legion Chaplain, artificer armour, refractor shield, plasma pistol (120 points). Field with one of the aggressive close combat squads below (or even the terminator squad). Terminator squad, 2 chain fists, 3 power fists, 3 x combi-plasma guns, sergeant with grenade harness (241 points). This is a slightly mixed purpose squad to field with the praetor. The combi-plasma guns come from the tactical squads and will therefore need some minor conversion work. The set up here is to be able to tackle enemy elites, as well as pose a strong threat to vehicles in close combat. In a pinch, this could be swapped to a command squad if desired but there's nothing to build a command standard bearer out of, without some moderate conversion work or kit bashing. So we'll leave them as a terminator squad. Naturally, the plasma components could be swapped out for melta guns for a different type of threat against tanks, but given how much armoured ceramite is around, I prefer the plasma option here. Give this squad the sniper universal rule and take aim. Go with fearless here to save points on the vexilla and team up with the chaplain. Get in to combat as soon as possible. The plasma guns can be swapped out with the melta guns if desired. Consider taking squad with melta bombs. Veteran Tactical Squad with 10 members, 1 legion vexilla, 1 nuncio vox, 2 with missile launchers and suspensors plus flakk missiles, sergeant with artificer armour and power fist (305 points). Take tank hunters here and stand back and shoot. Consider adding squad wide melta bombs here. In fact, I recommend taking the melta bombs on either this one, or the close combat squad above since you have some on the sprues. Contemptor Dreadnought, Kheres Assault Cannon, Power Fist with heavy flamer (200 points). I like this set up due to its flexibility. It can support every element of this army very nicely. Total army points cost = 1613 points. This army is slow and can be outmanoeuvred. It needs to be expanded with transports (rhinos, drop pods, storm eagles, land raiders) as well as other support elements (vindicators, predators, heavy support squads, Sicaran tanks, etc.). In principle, one of these veteran squads could be switched out for a seeker squad which might provide an interesting option if given a rhino (etc.) to improve its movement. For a legion specific option, the Night Lords don't look too bad if some of the squads are treated as terror squads. Iron Hands might be good for taking incoming fire despite being slow. Iron Warriors too to ignore some of the incoming fire's effects. Alpha Legion could be excellent here for infiltration purposes. Drop some points if needed to make it under 1500 points by eliminating the chaplain. Expand to 1750 points by upgrading some of these squads (one with melta bombs everywhere, and perhaps another as a full seeker squad, or even a veteran squad where everyone has power swords?). This is what a Storm Eagle looks like fresh out of the bag - lots of bits! And this is what the first few (recommended) steps looks like in the assembling of the Storm Eagle. The sides of the craft have been assembled, and I've completed the engines. I'm sorry to report that at this stage, my drill bit snapped in two. I therefore need to go shopping for a new drill bit, whilst half of the old one is stuck inside this assembly at this stage! Regardless, this assembly has been good so far, and I've enjoyed doing it. Most of the bits have been non-flexed, and those that were slightly warped were simply to straighten out. The proof in the proverbial pudding will happen when I start to put the other bits on the craft to create the main cargo hold. My only complaint so far is that some of the plastics don't mesh nicely with the size of the resin parts. Nothing too serious, but the engines were a bit fiddly due to this very issue. The new FAQ and Errata digest from Forge World came out whilst I was offline the other day. In today's post I wanted to focus on a couple of points that have arisen from the new document. For the main part it covers all the other errata that have previously been issued, but also adds some new and exciting things on top of them, plus a contentious point that I will turn to later. The first major point in the document is that Terminators who are wearing Tartaros armour can now make sweeping advances. I cannot underscore enough what a big deal this is. Indeed, it is a bit of a game changer as to how one might approach building terminators in army lists. By fore-going the Cataphractii armour and an extra pip in invulnerable save, we gain the ability to rid ourselves of an opponent outright in close combat. Therefore, I would expect to see many more builds involving Tartaros amour. Close combat builds specifically, to be sure. Hence more power fists, thunder hammers and even the none-upgraded and humble power axe will be prevalent here, rather than focussing on long range firepower. I would also expect to see more of them in land raiders now as well - rather than deep striking on to the board (although that also remains a viable tactic). Even pairs of lightning claws become a distinct possibility here too. These two character models now have rules that are official. Although they could have been considered official before, the new document makes it very clear and adds in their entries. Presumably they will be included in a future publication, or the re-working of the "red books". On par with their contemporaries ten millennia later, dreadnoughts now have a modified profile. This makes even the ordinary dreadnoughts a very attractive prospect to army list builders. All varieties of knights -- including the ones from Warhammer 40,000 -- are now valid to field in the Horus Heresy. This is awesome, as we can now use the fully plastic kit to build our own knight detachments for use in this game, rather than the resin variants. Not that cost might be such an issue if one is already playing Horus Heresy era games, arguably. Sadly, relics are noted as not being intended for regular (or casual) play. They are only intended for use within narrative campaigns, as presented within Conquest. What this means is that the Alpha Legion combination of automatically exploding tanks is not going to happen in tournament play. I am actually sad about this and regard this as somewhat contentious. I noted in my original post on how to automatically explode tanks that this would probably be changed by Forge World. It seems that this prediction has come true. But not in the way I would have originally thought. Regular Warhammer 40,000 armies all have access to relics. To deny the legions, Solar Auxillia, and the rest access to relics in regular games is really sad to see. In competitive play, these things might be taken care of by compositions scores and similar. But to just outlaw them outside narrative games is disappointing. I'm really happy with these changes apart from the relics. It really is a very good move by Forge World and demonstrates a commitment to their product line and the balance striking required for a modern war-game. Long live the Heresy! The Galaxy is a large place. On some worlds, an Imperial muster is bound to take place, and it seems that this exhibit demonstrates that on a very grand scale. This diorama is of a parade ground for the Imperial Guard (or Astra Militarum as they're now known). The mighty Hammer of the Emperor marching and rolling forth is being overseen by a combination of senior ranking officers of the army, as well as the Imperial Fists chapter of the Space Marines. If you look closely in the pictures, you will even see an Imperial Fists rhino parked at something of an odd angle to the side of these proceedings. I like this touch in particular -- the presence of the Sons of Dorn shows some connection to the Imperial Army that I'm not quite sure of (are they being subservient to the Army, or are they in command of the Army? I could not make up my mind on which way around the chain of command went from just looking at the display - so let me know if you have an opinion). All around the diorama are the impressive vehicles and walkers of the Army. Of course, there is also the Imperial Guard themselves. If you scour the pictures carefully, you'll see that they are for the main part marching in exacting lock-step with each other. This is an impressive bit of posing guardsmen on a very large scale that takes the breath away. In the background to all of this are large scale weapons that are pointed at the skies. Such macro cannons are indicative of a very fortified world (like Cadia!) that I was particularly pleased to see. I think my only criticism is some of the plain steel walls at the back of the diorama -- they've simply attached some cogs and pillars to the front of these, but I might have liked to have seen some segmentation on the chrome-looking pieces. There are plenty of other "Easter Egg" style things in the pictures as well. For instance the hanging flags are particularly good and (to me) even scarily reminiscent of war reports that I have seen on television in our own world. Very impressed with this diorama -- full marks for layout and execution. And bonus points for being intimidating and reminiscent of real musters. There are many ways to build a Horus Heresy era army. In the previous post, we spoke about the simple basics. This ranged from how to think about the rule differences from ten millennia in to the future (e.g., fear), and how to start constructing an army from 1 HQ and 2 Troops slots using various rites of war. In this post, we will turn to making a start at looking at synergy (but won't finish it in this post). Most armies that you will face from the Horus Heresy range are built in a thematic and fluffy manner. This does not mean in the slightest that they are not competitive. They can be absolutely devastating - whilst remaining fully thematic at the same time. Some though are thematic, but lack the punching power and competitiveness of others. The key difference between those that can do well and those that do not is synergy. By synergy, I mean that one component of an army enhances, combines with, or boosts (i.e. force multiplies) another component above and beyond what it would be otherwise. In this post, I'm largely (but not entirely) going to avoid talking about individual legions, and instead try to focus on generic components. In later posts, we will look at the individual legions in turn (well: the published ones at any rate) to see how we can enhance the synergy inside them. In fact, I've already noted one extreme synergy in regards to the Alpha Legion when I looked at how to blow up tanks automatically. All that you need is a saboteur, Armillus Dynat, and the combat augment array relic. The total points cost for that synergy (or combination) is something like 130 points for the saboteur (although this could be less for a basic saboteur), 200 for Dynat, and 35 points for the array. That makes a total of 365 points to take out a tank automatically. An Alpha Legion army army will make at least half of these points back by taking out a land raider. The rest of the points might sound expensive, until you figure in to this deal that you were probably going to take Dynat anyway. Therefore the "real" cost is simply the addition of the saboteur plus the array (165 points) to the army you were going to have Dynat command anyway -- this is easily cheap enough to take advantage of and will make the points back. Dynat is effectively a praetor replacement and is giving access to the rites of war which you also wanted to have as per the previous discussion. Hence his points cost is not material to this equation in my view of these things. I will start by looking at the consuls (with a large section on Apothecaries), and then move on to the generic Rites of War available. For the main part, these are available to everyone. I'll finish off by looking at fortifications. Most of these synergies are not powerful or game breaking, but they're meant to just get you going with thoughts and concepts. Both an apothecary and a Primus Medicae provide a strong bonus to any unit which they form a unit with in the guise of "feel no pain". As such, they are a really basic example of part of an army that provides synergy with other components. Or put another way: they improve the survivability of a key unit. Which unit to attach them to is a more interesting question though. Clearly, almost every unit in an army would benefit from having feel no pain and consequently improving their survivability. Yet, there are some units that would benefit more than others. For example, a back field heavy support squad that is in cover would do well out of it, but perhaps a more front line unit would do even better. (c) a squad that already has excellent survivability and would be enhanced even more. The first two suggest that core troops such as tactical squads or breacher squads would be ideal. However, it is the last possibility that will scare opponents even more. Consider attaching to a terminator squad for example. You have now formed a unit that potentially has a 2+ armour save, a 4+ invulnerable save (with Cataphractii terminator armour), a 5+ feel no pain save, and potentially a cover save as well. This is downright excellent (if a little bit rude to your opponent). With some legion specific terminators, this gets even better (or ruder!). Consider for example attaching a Primus Medicae to a Salamanders Fire Drake squad armed with storm shields. You now have terminators with two wounds each as well as all the good saves. That is simply amazing. But it will categorically not earn you any friends whatsoever. Heck, with thunder hammers and storm shields, such a unit can probably take on a Primarch and stand a good chance of winning. Add in to the above mixture a Spartan, and this will no doubt form the core of many (generic) tournament 30k army lists simply because of the awesome survivability synergy. Treat this consul as you would in games from later millennia. Specifically, squads that are meant for melee should be joined by it. In particular, I like assault squads to be accompanied by chaplains, or generally anything that is fast moving, and wants to get in to combat, and preferably with a few power weapons (or similar). Here is a consul that should be placed alongside a heavy support squad - or even a tactical squad using fury of the legion. The main reason for doing this is the bonus to ballistic skill that the Master can give the accompanying unit. Additionally, the large pie plate he can bring once per game can be very complementary to a build that has lots of such pie plates. Take a couple of these, along side items like plasma cannons, havoc launchers and the like and you have the makings of a strong pie plate focussed army. You just need some anti-air really. In some ways, vigilators are odd units. But, if your army is build around a swift alpha strike concept, then the vigilators can really help it to shine. By inflicting some early wounds and perhaps even gaining first blood, they can turn the tide of an entire battle. Additionally, with the ability to grant scout, certain units that they join can be boosted to get in to range of deadly weapons (or even melee) very early on in the game. Clearly this suits legions like the Raven Guard and Alpha Legion very nicely. This is a surprisingly versatile consul choice for an army. Able to get a 3+ invulnerable save thanks to a familiar, they can be really good alongside other terminators for a close combat boost. But in terms of synergies, they make an excellent way to open the door to robots in your army that can complement other approaches. The spread of rad grenades is also really important as it allows the squad to take on a (monstrous?) opponent even easier. In a nutshell, they add wrecker and tank hunters to their attached unit. This is very nice for enhancing heavy support squads! Their Voxes can also help with lines of sight to provide your heavier weapons a good way to see other targets. You'll notice I've not mentioned Moritats, Champions or Centurions. In general, these are not force multipliers and don't directly provide synergy or boosts to squads that they join beyond their own attacks. What they do provide is a tool to caused extra damage in a very particular way (depending on the build). Every rite of war can act as a force multiplier for an army. Hence if you do take a particular rite of war, you will need to exploit it as best as possible. For Angel's Wrath, we want an army that has a number of units with jump packs. This might mean assault squads, but could also be other squads (and independent characters) as well. It is important to add in characters that complement jump packs and the "hit and run" rule. So, chaplains, and almost everything that adds to attack and durability is important here. With armoured spearhead, taking some characters able to repair tanks is a suggestion, but not a necessity for the army. If all your infantry must be in a transport, then you might as well take infantry that want to be somewhere else. Like terminators getting to the front line and anything that helps them get there. Or objective secured troops having a boost to survivability. In general, this is one to think about bonus survivability in (e.g. Apothecaries). Orbital assault provides deep striking. Hence you might want to think about characters and units that can take upgrades to ensure no scatter on deep striking in. And ones that ensure infiltrators can't get close as well. Clear a landing zone if required and get on with the job is the order of the day here. Pride of the Legion provides excellent synergy for most things. Making an elite unit even more elite is what synergy can do for you here. Add in apothecaries and so on to make your enemy think carefully about that they're going to do. As fortifications go, this one is outstanding for its torrent boost to anything armed with a flamer. Consider placing a tactical support squad (with flamers) or heavy support squad (with heavy flamers) behind these pipes. Sit somewhere critical and watch as assaulters think twice and thrice about assaulting your position. Buy some tank traps to go in front of the pipes and the job is done. Death Guard and Salamanders will like this even more than other legions too. A few people have asked me about army lists in the Horus Heresy gaming era and how to create them. This year, I'm going to write a series of articles on making army lists for the Horus Heresy. My focus will be on the Legions - at least to begin with - as they seem to be the most popular and the faction that I'm most accustomed to dealing with. The first thing to be aware of is that the Horus Heresy era is very different to ten thousand years later for space marine armies. With the exception of certain Salamanders' terminators, there are no thunder hammer and storm shield armed terminators for example. There are more fundamental points to make though. It is that same game, with the same rules, but the balance is significantly different. Therefore, if you are coming to the Horus Heresy era space marine legions from the "future", then you will need to make some mental adjustments to how you go about making an army list and how you play your army. Firstly, if you are going to face off against forces from a different millennium, you need to understand that you and your opponent should agree which units are "scoring" in the sense of "objective secured" and which can deny the claiming of objectives (NB: the implacable advance rule is the same as the objective secured rule for these purposes). Also understand that Horus Heresy era legion lists are at a disadvantage at "low" points levels (such as under 2000 points), but can shine at "higher" points levels. Additionally, the Maelstrom of War missions immediately will put Horus Heresy era armies at a distinct disadvantage since they do no spam multiple small units in the same way or even to the same degree as the core game does. This is because in Horus Heresy era gaming, there is a small "tax" on the baseline cost to a unit. Upgrading them with more bodies on the ground makes this initial taxation seem small though. Hence you can expect much larger squad sizes - as well as much more specialised squads - compared to the core game. Blast weapons, as a consequence, can therefore be much more attractive and punishing to enemy forces. The good news is that the Horus Heresy era game is a much more balanced system. There are not the same extent of "death star" units compared to the core game. There are threats, counters, and core units to consider, but the point remains that thematic building and balanced army list building is a much better tactic than building an auto-win death star list (which largely, but perhaps not exclusively, simply does not exist). Fear deserves a subsection of its own in this discussion. The "And They Shall Know No Fear" simply does not exist in the Horus Heresy era. This makes all units, characters and squads subject to fear. They can be totally swept in combat if they lose by just one wound difference. There is little more disheartening that coming from playing space marines in the core game to the Horus Heresy only to discover this the hard way. Chaos space marine players of the next millennium may already know about all of this. There are multiple ways to mitigate this though. In many squads, the ability to re-roll morale tests can come from Legion Vexillas. I regard these as an essential upgrade to invest points in if you want core squads to stay alive. Close combat is a real unit killer in the Horus Heresy and is a very viable way - even in 7th edition - to clear an enemy off the board. Shooting is, of course, similarly able to wipe out units, but both methods are nicely balanced in the Horus Heresy (whereas shooting is King in the core game at the moment, it seems). In a similar manner, command squads can be very valuable as well. Indeed, so important is fear in Horus Heresy, that the Night Lords legion is highly focussed around it and can readily wipe off whole armies from the board because of it. Yet, it is not a hard "automatic win". Should the Night Lords come up against a Salamanders army (and some others as well), then their entire focus is can be negated. It therefore pays sometimes be a generalist and balanced force, sometimes wrong-foot your opponent, and sometimes to be highly specialised and thematic. So yes, the Night Lords could certainly field a very general army like every other legion and do well with a balanced approach. They could also go vehicle-heavy just for the hell of it like every other legion - but they're certainly not known for that. They're more known for getting in to close combat, causing fear, and wiping (via sweeping) enemies off the gaming board. All three approaches are valid. It is just that in some situations, one is going to be better than others. And the latter - the thematic approach - is usually something that other legions cannot emulate easily. It is for this reason, and this advantage, that most legion army lists will be thematically constructed. Finally, it is because of the effectiveness of fear that the stubborn special rule is at a premium in points value for Horus Heresy units. For me, I have chosen the Alpha Legion. I feel their theme is one that I like: intelligent marines that put the squad before the individual and are very tactically flexible. Plus, who knows whether they're really traitors or loyalists. I'm looking forward to the 6th core book to see about including some other black shield style marines in my army might work as well. Their metallic blue paint scheme is something that I've never done before, so I wanted to try my hand at this, rather than greens or reds again. With the Alpha's, I get to choose not only my own special miniatures, but I can potentially steal other legions' miniatures as well - so I get the best of every world possible. I like their mutable tactics special rules and all things considered, they have the X-factor for me personally. Clearly my choices will not be yours though. Since you will most likely be using the Age of Darkness force organisation chart, you will need at least one HQ and two Troops choices. The exact nature of these may depend on the points value of the game that you are playing. In almost every case, I would seriously council getting a HQ with the "Master of the Legion" special rule so that you can select a rite of war. The only time I would not consider doing this is for a very special named HQ character that you could take for a given legion, or if the points value of a game was particularly low (say 1000 points and under). In that case, I would entertain having a consul as a HQ. Secondly, I would consider not using a rite of war if I wanted to take certain allies or certain fortifications. For instance, if I wanted to recreate the heyday of the Iron Hands working closely with the Emperor's Children, then I cannot use legion specific rites of war as they prevent having allies. I'll cover these cases at a later point and in a later post. Hence, for "normal" games, and in the absence of named characters, I would advise taking a Praetor to access rites of war. In low points games, my favoured HQ would be a Delegatus Consul, or a close combat exponent HQ. I would select the Delagatus principally because they can unlock veterans as troops under the Chosen Duty rite of war. The close combat HQ on the other hand would be to place with another close combat squad. This might be a chaplain, champion, centurion or similar. Note that some consuls cannot fulfil a compulsory HQ selection (e.g., librarian, medic, and so on). At higher points levels, multiple HQ choices are completely viable and can (and should) be taken. In terms of core compulsory troops, there are tactical squads, assault squads and breacher squads. Each fulfil a different role on the battlefield and each are different in their strengths and weaknesses. I will simply refer the reader to my previous links and articles on these squads for more in-depth information on these. Suffice to say that artificer armour on the sergeants is a must due to the abundance of good armour piercing weapons. (4) Psykers (i.e. something like your own librarian to help or hinder the opponent - this is less critical in Horus Heresy, at least until you come up against a Word Bearers opponent that is optimised for the psychic phase - and presumably the Thousand Sons as well). (6) at high points levels: superheavy class vehicles (i.e. something like your own D-class weapon to deploy?). (7) death star style units (i.e. some high strength, ignore armour, ignore cover, and generally mess around with, or run circles around / ignore in game something that is dominating your opponent's points spending?). These are just some random thoughts -- usually (6) and (7) will not be too much of a worry if you've taken care of the others. A rite of war is a bit like a formation that becomes unlocked so long as you have a Praetor or other character who is a Master of the Legion. It gives army wide bonuses, but is balanced up with some drawbacks as well. Each legion has their own rite of war that I will cover in later posts. For the sake of this post, we can think of the principle four rites of war available to every legion army. Sure, some legions are more suited to certain rites than others. But in principle, every legion can run all of the basic rites of war. Which rite of war you want to run depends on your desired play style. For an all-terminator (or all-veteran) force, the Pride of the Legion may be what you want. Death Wing players will be right at home here -- so long as you don't want to deep strike in. This would suit any legion wanting to field "the best" of their legion. On the other hand, if you do want your terminators to all deep strike in to play, then the Orbital Assault rite of war is where it is at for you. It means everything must have the potential to come in to play from orbit - so teleportation, jump packs and drop pods abound in this build. Synergies with legions like World Eaters and Raven Guard are obvious here. For the tread-heads, there is the Armoured Spearhead rite of war. Get access to land raiders instead of rhinos for dedicated transports and enact tank shocks at will. Finally Angel's Wrath provides a hit and run bonus to to anything with a jump pack. Hence armies that rely on a with mode of assault are highly favoured here. Here are a few "core" army components (1 HQ and 2 Troops) examples that take in to account the above logic and could form the core of an army. Each of them will require expansion, and I've indicated a few directions for each of them. Note: I've only focussed on generic characters that are able to supply "Master of the Legion" here. I've not gone in to armies without such characters (e.g. where the HQ is a chaplain or similar). I largely see such consul choices as being secondary and complementary to having access to Master of the Legion. Praetor with jump pack, iron halo, paragon blade, digital lasers, archeotech pistol (205 points), 2 Assault Squads each 10 strong, 2 plasma pistols, sergeants with thunder hammer, plasma pistol, melta bombs and artificer armour (330 points x 2). Total cost is 865 points. I would personally run this with Angel's Wrath for the hit and run effect. Place the praetor inside one of the squads and go hunting. In principle, there is nothing in the game they cannot handle apart from fliers. Hence you will need to expand this basis to think about this. Morale might be a problem here too, so be careful with positioning. I would also expand the numbers contained in each squad. Praetor with power fist, iron halo, combi-plasma (155 points), 2 Breacher Squads, each 10 strong with 2 graviton guns and a legion Vexilla, sergeant with power fist, melta bombs, one breacher charge and artificer armour (310 points x 2). Total cost is 775 points. I like the idea of running this with an armoured spearhead rite of war. Charge out of land raiders and take on the opponent directly. Expand by purchasing said land raiders, clearly! The breacher charges can double up as a large close combat blast, as well as using the wrecker rule. Both squads can be deadly against elite troops, as well as vehicles. It is a slow army though, so transports are essential. If taking orbital assault, then drop pods are very attractive here, but then there is no mobility to follow up, so I would expand by getting some swift elements in there. Praetor in terminator armour with paragon blade, digital lasers, and a volkite charger (177 points), 2 Tactical Squads, each 20 strong, with a legion Vexilla, sergeant with power fist and artificer armour (285 points x 2). Total cost is 747 points. Possible Rites of War: Armoured Spearhead; Orbital Assault; or none at all! With 20 in each squad, this is one for no rite of war to be honest. Orbital assault will not work with regular drop pods only able to take 10 marines. Land raiders also only have a 10 capacity. Hence its a Storm Eagle or nothing to transport them. Praetor in terminator armour with paragon blade, digital lasers, and a volkite charger (177 points), 2 Tactical Squads, each 10 strong, with a legion Vexilla, sergeant with power fist and artificer armour (185 points x 2). Total cost is 547 points. Take Armoured Spearhead and give the troops a land raider each. Buy a command squad of terminators for the praetor and take a third land raider. This is an incredibly powerful build - especially with fury of the legion coming out of the land raiders. Can your opponent handle three land raiders in under 1500 points? Praetor in terminator armour with paragon blade, digital lasers, and a volkite charger (177 points), 2 Tactical Squads, each 10 strong, with a legion Vexilla, and extra close combat weapon each, sergeant with power fist and artificer armour (205 points x 2). Total cost is 587 points. Take Orbital Assault and give the troops a drop pod each. Buy a command squad of terminators for the praetor and deep strike in to the game. Consider adding melta bombs or giving some ranged anti-tank weapons elsewhere in the army - there should be plenty of spare points for this approach due to the relatively cheap nature of these troops. Praetor with jump pack, thunder hammer, melta bombs, iron halo (175 points), 1 Tactical Squad, 20 strong, with a Legion Vexilla, sergeant with power fist, artificer armour and melta bombs (290 points), 1 Assault Squad, 20 strong, all with melta bombs, 4 with hand flamers, sergeant with hand flamer, artificer armour, power fist (575 points). Total cost is 1040 points. With a mixture of assault squad and tactical squad, I actually favour the Angel's Wrath rite of war here. Buy a storm eagle transport for the tactical squad and team the pretor up with the assault squad. You will need to expand the army with some other elements to take care of enemy tanks more effectively perhaps, but it is a very strong build that allows the assault squad to escape (when needed) thanks to hit and run. I might be tempted to halve the size of the assault squad, but the intent is to form the core of the aggression here. Praetor in terminator armour with a chain fist and combi-melta (157 points), 2 Legion Terminator Squads: the first being 5 strong and armed with 4 combi-meltas and 3 chain fists (233 points) and the second being 10 strong armed with volkite chargers (395 points). Total cost is 785 points. The Praetor character here is chosen to have equipment identical to the Betrayal at Calth character for no other reason than it might be more available to some players. The first terminator squad is meant to deep strike (if a warlord trait enables it) in to an opportune position and take care of tanks and other elite enemies. The second is directly to annihilate enemy troops and objective sitters. I would expand here by purchasing more terminators, with at least on focussing on flamers and another on plasma, with a smattering of chain fists and thunder hammers to taste. Land raiders are required in all cases to get to where the terminators should be in case the warlord trait is not Void Walker. Legion Delegatus with artificer armour, thunder hammer (85 points), 2 Veteran Tactical Squads: the first being 10 strong with 2 missile launchers with suspensor webs, upgraded with flakk missiles, legion vexilla (270 points), the second being 9 strong, with 2 melta guns, sergeant with power fist, rhino (265 points). Total cost is 620 points. Here, the Delegatus "unlocks" the veterans as being core troops and the army must take them to fulfil the compulsory troops choices. That means that the under-pressure elites slot is still entirely free. Take more elites such as apothecaries, terminators, dreadnoughts and the like to expand this army, along with a smattering of tanks as well. The first veteran squad here should be given tank hunters, and the second given whatever is seen fit. Cut numbers down to make it under 500 points if needed.